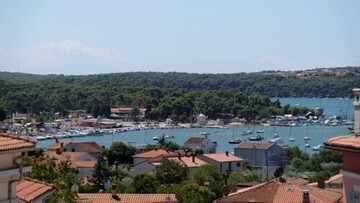 Detached house near Porec, with a swimming pool. The house consists of a large living room with kitchen and terrace, large bathroom with jacuzzi corner bath, storage room, two bedrooms and an open attic gallery space used as a third bedroomThe house has a pool of 24 square meters. It has the first stage of heating already installed, air conditioning, and preparation of the chimney in the living room for fireplace installation.